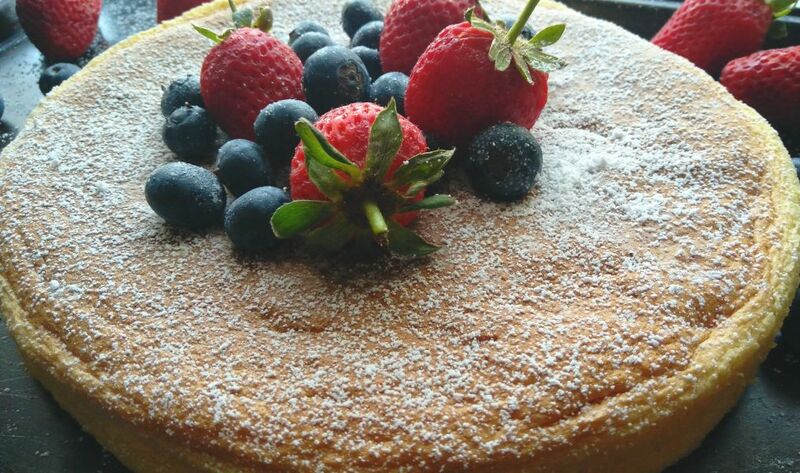 A Cotton Soft Sponge Cake with an ultra soft texture and outstandingly delicious taste. A week ago, my son celebrated his birthday. Since he is not a big fan of overly sweet desserts, cakes and frostings, I decided on baking this cake. Dusted with powdered sugar and topped with berries, it was absolutely perfect. The flavour and texture of this sponge is truly amazing, that it does not really need lots of frosting. ?Lol, that is another reason why I love this cake I am a total klutz at frosting cakes. Piping bags, nozzles and me just don’t get along that well. So if you do see something on my blog which had been perfectly frosted, believe me, it was just luck. I look at it in shock, like did I really do that and then quickly take pictures of it before my work of art gets eaten. However when I do make a two or three layer cake with this recipe, then it is sandwiched and spread with whipped cream or buttercream. No piping involved, just spread on with a palette knife. 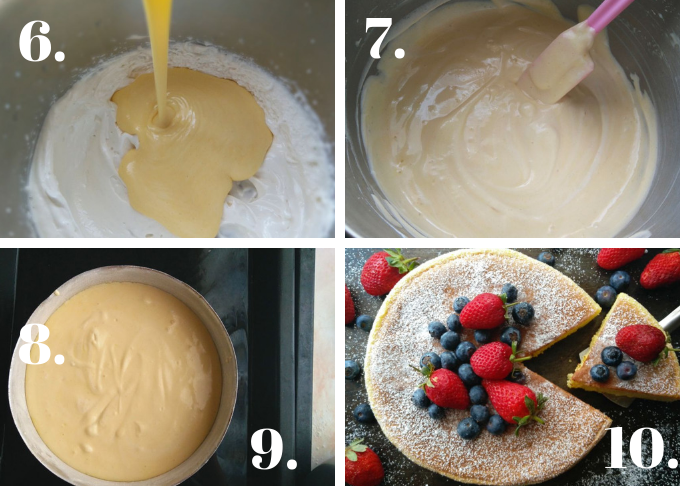 • If you are going to make more than one layer of this cake, I suggest that you make the batter in separate batches. Avoid doubling or tripling the recipe. • Beating the egg whites to a stiff peak is one of the important factors that create that soft fluffy perfection when baked. When you lift the whisk, the tip of egg whites go straight up and then fold over. It’s stiff enough to stand up, yet the tip is soft that it folds over. Avoid overbeating at this stage. Overbeating the egg whites will cause it to have a curdled appearance and is not usable. • Be gentle when folding the egg whites into the batter Use a spatula to fold in the egg whites into the batter. It is important to use light movements so that you do not deflate the beaten egg whites. If it is deflated, then the cake will be dry and dense. 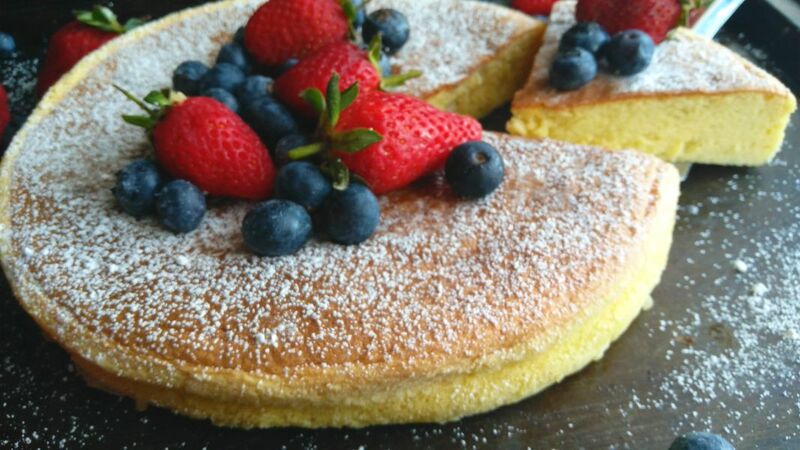 •This sponge cake is baked using the water bath method. This method consists of placing the cake pan with the batter in a large, shallow pan of warm water. The water surrounds and protects delicate sponge during baking by maintaining an even, low-moisture heat. It also keeps the surface of the cake level and prevents the cake from cracking. Pour the batter into prepared pan, and put cake pan into a large baking pan ( I use a large roasting pan for this purpose.) The water in large baking pan should reach 1 inch / 2 ½ cm up sides of cake pan. •The cake is going to deflate when you take it out of the oven. I am using an 8 inch / 20cm round pan for the cake. After baking, as it cools it will deflate and be approximately 2inches / 5cm in height. If you do want more height, then I suggest that you make a separate batch of batter, bake it in 2 pans and sandwich it with a frosting of your choice. To start, grease, line and lightly flour an 8 inch cake pan. Dust out excess flour and keep aside. 1. Heat the butter a saucepan, over low heat. 3. In a separate bowl, Whisk egg whites until foamy, squeeze a ¼ teaspoon lime or lemon juice and add sugar a little bit at a time, beating until stiff peaks form. 4. Add about 2 Tablespoons of the beaten egg whites into the flour and egg yolk batter. 6. Pour this combined batter into the rest of the beaten egg whites. 7. It is important that you gently fold this mixture until combined. Do not stir or whisk vigorously, just fold the mixture. 8. Pour the batter into the greased and lined cake pan Tap the cake pan on the countertop a few times and get the air bubbles out of the cake batter. 9. Prepare the water bath by pouring cold water into a large pan. I use a large roasting pan for this purpose. Place the cake pan with the batter into the large roasting pan The water in large baking pan should reach 1 inch / 2 ½ cm up sides of cake pan. 10. Bake in preheated oven 302°F / 150°C for 20 to 25 minutes or until the cake is firm and set in the center. Baking time is just a guide,as oven temperatures and cake tin sizes vary. If you find that the cake is browning too quickly before it has been baked, then just cover loosely with foil. Do not let the foil touch the batter. Once baked, remove from the oven and water bath. Leave the cake in the pan to cool for about 10 minutes before turning out. Cool completely and dust with powdered sugar or frost with a frosting of your choice. Cotton soft and amazingly delicious, So whether you turn this into a beautiful celebration cake or a delicious dessert, it is bound to be loved and enjoyed. Grease, line and lightly flour an 8 inch / 20cm cake pan. Dust out excess flour and keep aside. Heat the butter a saucepan, over low heat. Add about 2 Tablespoons of the egg white mixture into the egg yolk mixture. 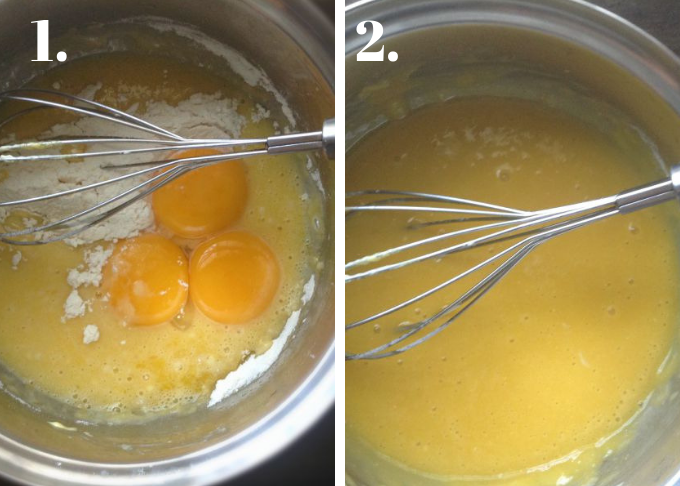 Mix until just combined and then pour this combined batter into the remaining egg white mixture It is important that you gently fold this batter until combined. Do not stir or whisk vigorously, just fold the mixture. Pour the batter into the greased and lined cake pan. Tap the cake pan on the countertop a few times and get the air bubbles out of your cake batter. Prepare the water bath by pouring cold water into a large pan. I use a large roasting pan for this purpose. Place the cake pan containing the batter into the large roasting pan The water in large baking pan should reach 1 inch / 2 ½ cm up sides of cake pan. Bake in preheated oven 302°F /150°C for 20 to 25 minutes or until the cake is firm and set in the center. Baking time is just a guide,as oven temperatures and cake tin sizes vary. If you find that the cake is browning too quickly before it has been baked, then just cover loosely with foil. Do not let the foil touch the batter. Once baked, remove from the oven and water bath. Leave the cake in the pan to cool for about 10 minutes before gently turning out. Cool completely and dust with powdered sugar or sandwich and cover with a frosting of your choice. 1.Beating the egg whites to a stiff peak is one of the important factors that create that soft fluffy perfection when baked. 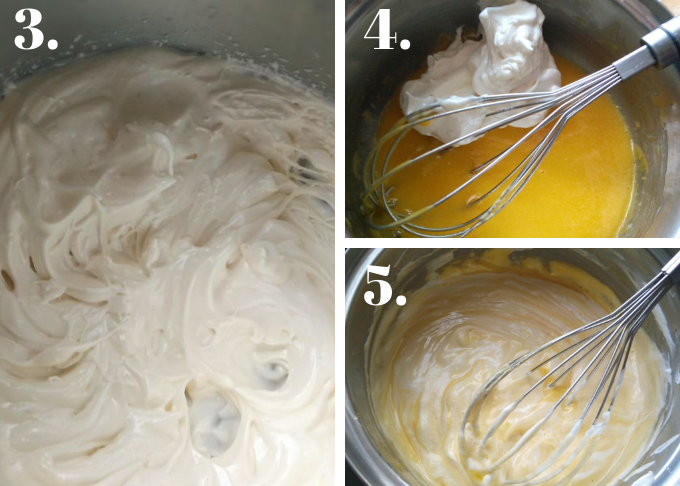 When you lift the whisk, the tip of egg whites go straight up and then fold over. It’s stiff enough to stand up, yet the tip is soft that it folds over. Avoid overbeating at this stage. Overbeating the egg whites will cause it to have a curdled appearance and is not usable. I love this step by step post on making this cake!! It looks so light and airy! I too have issues perfectly frosting cakes ughhh. So I like your sprinkling of powdered sugar on top!! I love a cake that is not too sweet. This cake is beautiful in its simple presentation. 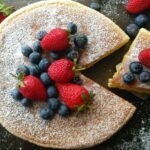 The beaten egg white makes all the difference and makes the cake so light and fluffy.Pinning. Happy belated birthday to your son!! 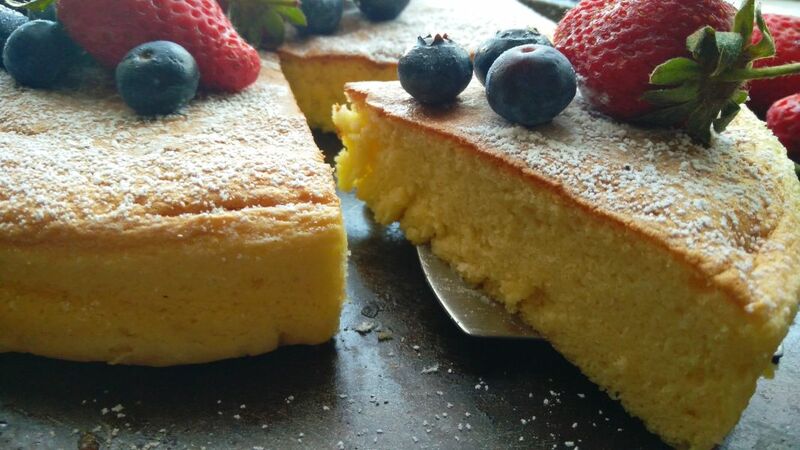 You can’t beat the texture of sponge cake, and when topped with fruit, it makes a delicious dessert! Great step by step photos Ashika! This really does look pillowy soft and I’d love a huge slice! Happy belated birthday to your son! Thank you so much Kelsie. I love cakes (and most desserts) that are not too sweet. but I’ve never made a sponge cake. 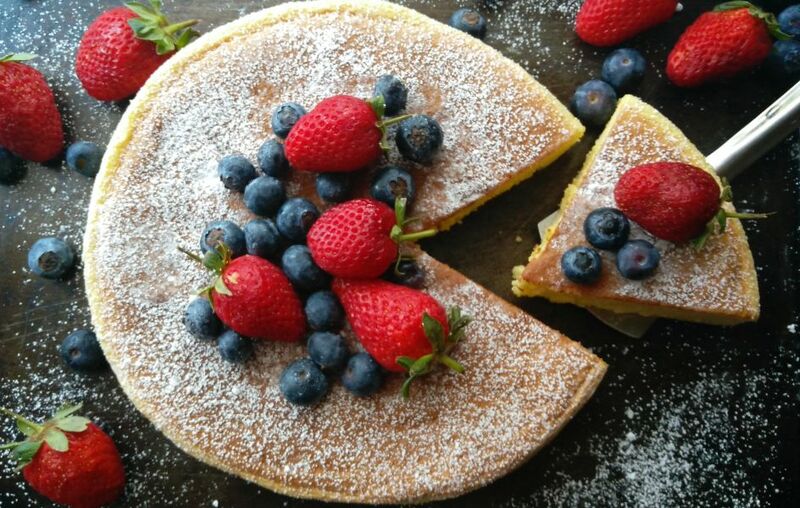 This one looks so delicious, though ad so lovely sprinkled with confetioners’ Sugar and a bit of fruit. I’m pinning and hopefully give it a try soon! Thanks for the recipe! I am already hungry just by sighting these pictures! Happy birthday to your son!